Known as one of the world’s most spectacular and challenging treks, the Kokoda Track in Papua New Guinea, offers the experience of a lifetime. On the 75th anniversary of the campaign between Australian and Japanese troops, author Nikki Moyes trekked the 96km of track where her grandfather acted as a translator. With its steep, rugged, and muddy mountain terrain, the track also offers stunning scenery, magnificent jungle plant life, and friendly locals. This is what it is like to hike the Kokoda Track. Includes photos and translated Japanese WWII documents. This is a compelling account of the author's trek on the famous Kokoda Track. There is an excellent mixture of history and the reality of what the track itself is like and by the end I felt exhausted, as if I'd walked with her. I had no real idea of how difficult the track is, but now I do. The photos that accompany each chapter provide additional interest, along with the pieces from the authors grandfather, a Kokoda Track veteran. 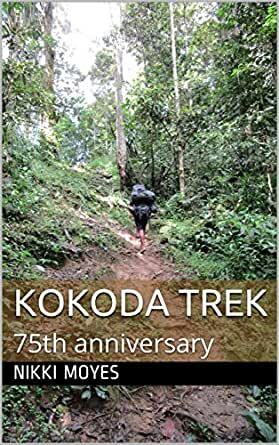 I highly recommend this book to anyone who has an interest in the Kokoda Track. I'm not much for hiking. Which is why I enjoyed this book so much. Nikki Moyes took me on a historical journey, filled with beautiful scenery, proud history, danger and a collection of colorful and interesting people... and I didn't have to leave my couch! This book did a great job of documenting a little known pieces of WWII history, in a way I have never seen before. My knees ached by the end of this account! The author documents the incredibly long, rain and mud filled journey on the Kokoda Track in Papua New Guinea. Following in her grandfather's footsteps, she honors him and his comrades throughout the story. Sharing her photos and documents from World War II, Moyes enlightens the reader on the terrain and history of the track. I witnessed the arduous trek through the author's eyes, reliving the lives of so many who were sacrificed on the trek. It's easy to forget the grueling nature of war and how soldiers had to fight with so much more than just the enemy side. Here is a segment that captures what might have been going through the minds of those on the trek. "Normally the stress on the mind causes a want to discontinue the action and it becomes dangerous to the concentration." With bits of humor and distinct modern characters, this work brings the past into clear focus with the present. I highly recommend this book for those who are looking to vividly picture and understand this slice of history and war in a more exotic location. 5.0 out of 5 starsA touching tribute. I've had the pleasure to know Nikki Moyes through her fiction work, If I wake, and was thrilled to get an advanced readers copy of Kokoda Trek. Firstly, let me say that travel journals are not my thing. That said, I was intrigued on two fronts. One, I know Ms. Moyes as a talented author. Two, her reason for doing this trek, in memory of her grandfather who was part of the Australian forces retreating from the Japanese, touched me deeply. It's well written, as I would expect. Light, with a sense of humor, yet poignant, with reminders of the sometimes tragic, sometimes heroic events that unfolded in New Guinea in 1942. The photography is stunning, the historical references are chilling, and the physical fortitude required to do such a trek, especially when, unlike her grandfather, she had a choice, is admirable. As a Canadian, I found it informative, and can only imagine that for a citizen of Australia, or Papua New Guinea, it would a shame if this event is forgotten to history. Luckily, through this book, I don't think it will. Worth every penny, and enjoyable every word. Kudos.